When I try new sushi places, I have a process on how to figure out if the eatery is worth my time for future regular visits. For me, sushi is all about good raw fish and well prepared sushi rice. 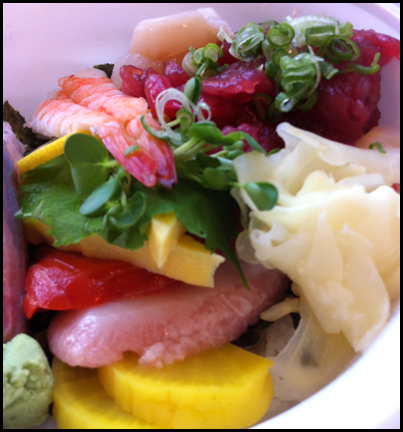 In my experience, a Chirashi don is good way to try out the quality of both. 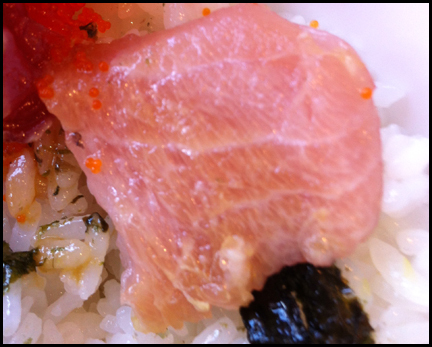 I feel this simple dish of sashimi on rice can tell you a lot about the chef serving you. From the fish he selects, to how he arranges the fish and the garnishes he uses, it reveals the level of attention and detail the chef puts in his work. 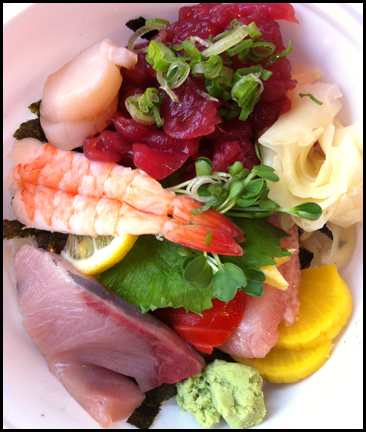 When executed well, I feel the Chirashi don is one of the prettiest things you can order at a Japanese restaurant. Thanks to the chowhound board, I was aware of Zero One Sushi for a while but it was just a little too far from my old office to get to. Well with my office relocated, I was only 10 minutes away. You wouldn’t expect a quality eatery when you walk in. Everything about it screams budget sushi from the self-serve tea to the plastic bowls and paper plates. The only thing that betrayed the above par quality within this humble setup was the scent of bonito in air. 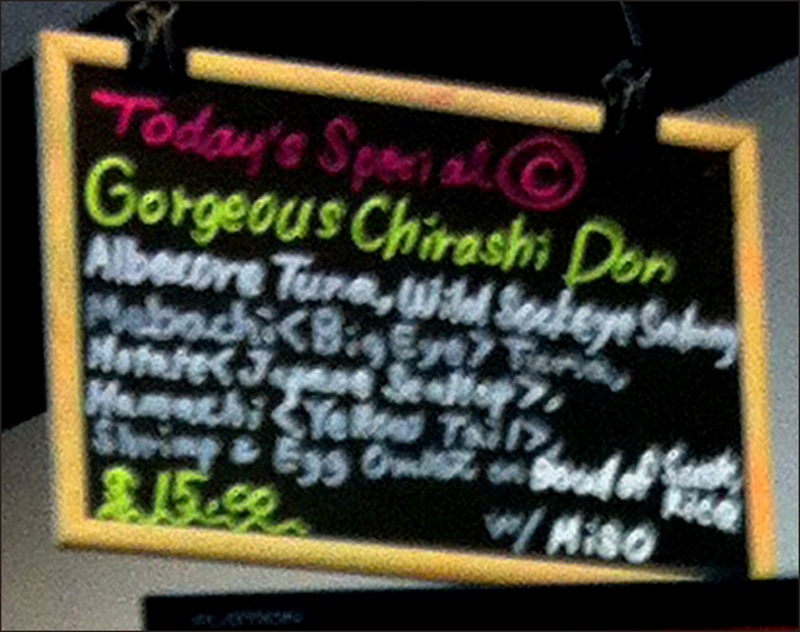 I had a feeling I was in for a treat when I realize they had 3 levels of chirashi dons available: basic, gorgeous and super fancy deluxe (not it’s real name but it was the most expensive). I chose the gorgeous version and it was indeed very beautiful with its bold colours and decorative garnishes. 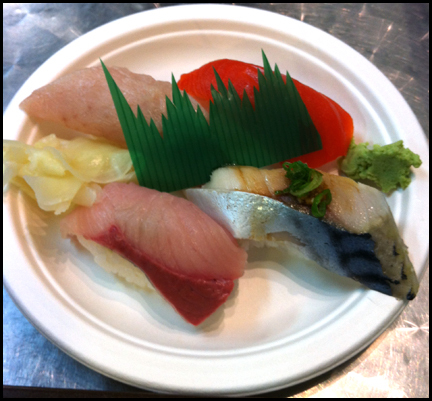 The fish consisted of Albacore Tuna, Mebachi (big eye) tuna, Scallop, Wild Sockeye Salmon, Hamachi, Shrimp and Tamago. All the fish was fresh and was tasty. The chef even sauced the Mebachi with a sweet soy. The rice was seasoned and had the right texture, soft but not mushy. Despite being served in a plastic container, Zero One Sushi’s gorgeous chirashi was one of the most picturesque and delicious I have had in a while. The thing that really made such a great impression on me is the attention to detail. The chef didn’t have to include the shiso leaf, radish sprouts, strips of nori, pickled diakon, green onion slices, and lemon slice. These items are extras that often not all included at other sushi places. However as you can see in the pictures, the inclusion of all the garnishes make the dish visual stunning and very appetizing. As I continued to eat I discovered more surprises. The chef included small diced shitake mushrooms on top of the rice and underneath the seafood. I’ve never seen this done before. 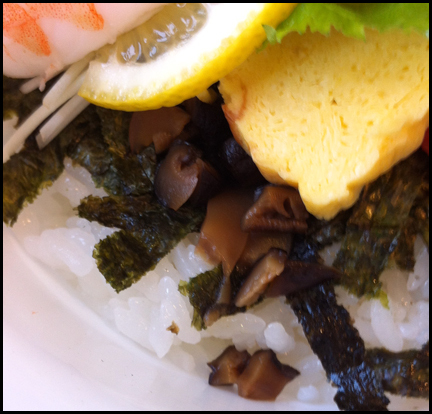 The mushrooms added more flavour to the dish. Another small detail that I appreciated was the cut of Albacore tuna the chef chose to include. It was the toro cut which is the belly part of the fish and is just fatty goodness. Once again, the chef didn’t have to do this. Most restaurants use a cheaper and less fatty cut of Albacore tuna. So as you can tell I was just thoroughly impressed with my gorgeous chirashi. The extra features I highlighted (the garnishes, the shitake mushroom & toro cut) are things that the Chef did not need to add to the dish. They could of cheap out like a lot of places would by including less expensive seafood like surf clam or Atlantic salmon but they chose not to. For $15 it’s a great value, considering a sushi place in North Burnaby is charging $18.95 for their charishi don and my go to place by my house, Sushimoto, charges $14 for a basic and $19 for a deluxe version. Upon a subsequent visit I tried their nigri (which is my second quality control measure I deploy to test new sushi places) and it was good. The nigri was prepared in the traditional fashion with wasabi placed under the fish. The salmon, hamachi, saba and albacore toro were delicious and the rice was well prepared. I was not a surprise given my earlier experience with their chirashi don. Zero One Sushi has definitely joined my roster of go to sushi places in Vancouver. I would even bring out of town guests to this place despite the disposable utensils and serving vessels. PS: Food blogging has been a humbling experience for me. It has been a challenge for me to post 3 entries per week that I wanted to do and juggle work, friends, my pug and other passions I have like the Vancouver Canucks. My hat goes off to all those that blog daily. I will continue to try my best as I have enjoyed writing about my food journey.